Puddletag is a Linux audio tag editor similar to Mp3tag (a popular Windows audio tagging tool) that supports ID3v1, ID3v2 (mp3), MP4 (mp4, m4a, etc. ), VorbisComments (ogg, flac), Musepack (mpc), Monkey's Audio (.ape) and WavPack (wv). I had this post saved as a draft for a few days because of a bug in Puddletag 0.10.4 which was finally fixed today in Puddletag 0.10.6. Tag to filename and Tag->Dir functions now handle patterns like '../%artist%' and './%artist%/%album%' correctly. 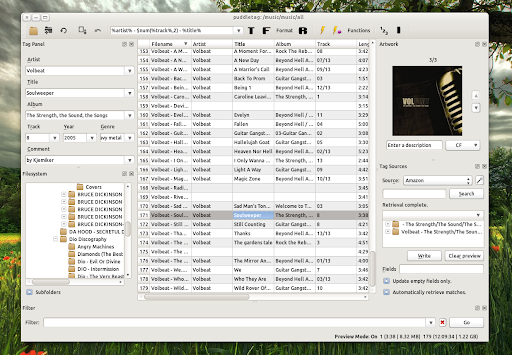 For other Linux distributions, see the Puddletag download page.